Garlic is one of those ingredients that I always have on hand: there’s a bulb on my kitchen counter and a jar of minced garlic in my fridge. I love it because not only does garlic add flavor and aroma to any dish, but it offers health benefits too. Studies show garlic may lower breast, colon, stomach, throat and skin cancer risks. It’s heart-healthy, too, as it’s been shown to prevent clotting. The secret to all these health benefits? Sulfides. Related: Find out why pairing garlic and onions with whole grains makes them even healthier. Related: Get flavor-packed healthy garlic recipes here. Unfortunately, those same good-for-you sulfide compounds leave you with dragon-breath aftereffects that can last days. If you’re that person who saves the parsley garnish to chew on after a garlicky meal, good for you—because new research (reported by Amy Paturel in EatingWell’s November issue) suggests certain foods may offer a remedy. Apples, spinach, basil, parsley: Studies show these and other phenolic-rich foods help kick garlic breath. 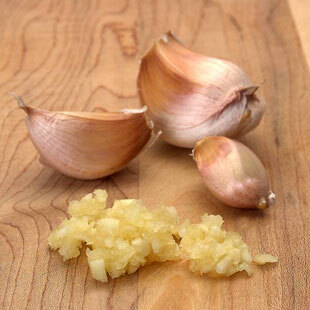 The polyphenols (compounds that act like antioxidants) break down the smelly sulfur compounds in garlic. “But only when they’re mixed with garlic,” says Sheryl Barringer, Ph.D., professor of food science and technology at Ohio State. For the biggest benefit, combine garlic and one of these foods in the same dish; eating them in different dishes at the same meal might help too. Related: At-home, natural remedies for headaches, nausea and more. Milk: A new study suggests that milk is perhaps even more effective at banishing garlic breath—particularly if you drink it before or during a garlicky meal. Researchers found that milk offered greater odor-reducing effects for garlic breath than other foods previously tested—prunes, basil, burdock, eggplant and mushrooms. “The water [in milk] rinses the mouth,” says Barringer, “but it’s not just the water; it’s the fat.” That’s why whole milk was more effective than skim. Related: Can milk really help you sleep? Green tea: Can’t stomach the idea of milk with your Asian stir-fry? Drinking green tea before or during a meal may also mitigate garlic breath, as the polyphenols reduce volatile sulfur compounds. Related: Add this to your tea to make it even healthier. So the next time you go heavy on the garlic, be sure to have one of these items on hand.